Many studies have suggested that the majority of acupuncture points are located over the peripheral nerves, near nerve endings. Pain, an unpleasant sensation that occurs in response to tissue injury, is a normal protective process that lets us know when something is wrong. Our nervous system is made up of the central (brain and spinal cord) and peripheral (nerve fibers, nerve endings, receptors) nervous systems, which work together, transmitting signals to and from the brain, spinal cord and other parts of the body via nerve fibers. There are three categories of nerve fibers, each responsible for different sensations: A-delta fiber (sharp, localized pain), B fiber and C fiber (generalized aching). If the spinal cord is overloaded with various signals transmitted by A-delta fibers, areas of our spinal cord can act as a gate, blocking the transmission of pain signals via C-fibers, thus diminishing or eliminating pain. Furthermore, our brain and spinal cord are capable of producing endorphins, a morphine-like substance, or other neurotransmitters, which can further block pain signals to the brain. 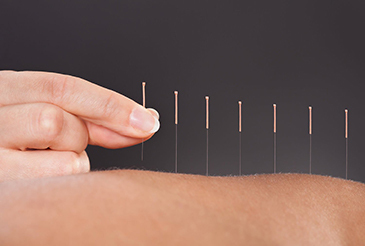 Acupuncture, which originated in China more than 3,000 years ago, is a treatment for pain and illness in which thin needles are positioned under the surface of the skin at specific points on the body. It spiked interest in the United States in the 1970s, following reports of the use of acupuncture as the sole analgesia during major surgeries. Many studies have suggested that the majority of acupuncture points are located over the peripheral nerves, near nerve endings. Due to our better understanding of pain, we realize that needle stimulation via acupuncture can close the gate and block the stimulation of pain signals within A-delta fibers located in or just under the skin or muscle. Acupuncture can also activate the release of endorphins (our body's own natural painkillers) within our central nervous system to further reduce the transmission of pain signals. For these reasons, acupuncture is rapidly becoming a very popular, cost-effective and drug-free alternative in managing severe and chronic pain of all kinds.